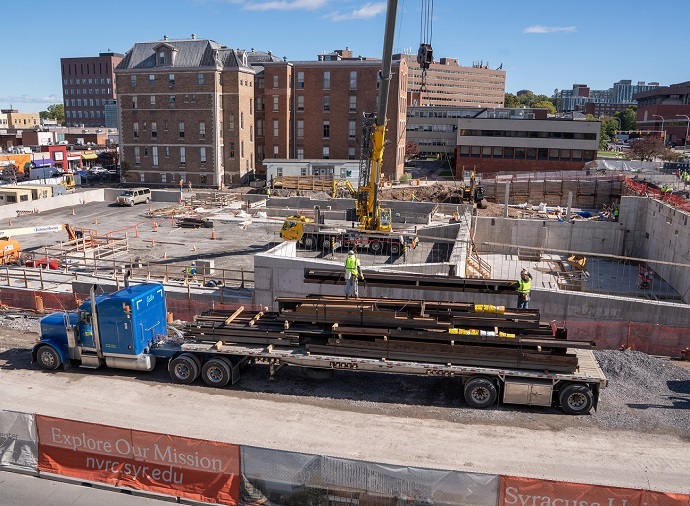 Three years ago it was a vision, today Syracuse University’s National Veterans Resource Center (NVRC) is becoming a reality, as each day, major construction milestones are achieved. 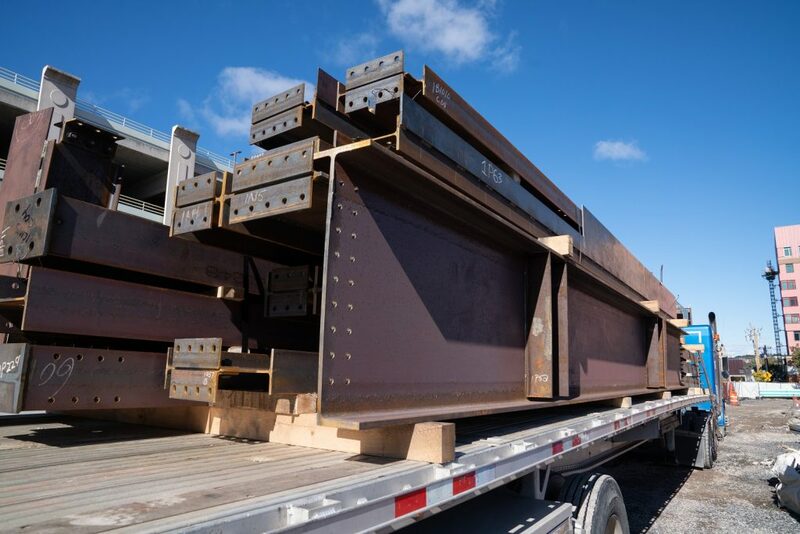 For example, on Thursday, Oct. 18, the first steel truck arrived on the NVRC construction site at the corner of South Crouse and Waverly avenues. And the next day, the first piece of steel went into the ground. A first-of-its-kind facility, the NVRC seeks to advance academic research, actionable programs and community-connected innovation in service to our nation’s veterans and military families. The NVRC also represents a key point of intersection between the University’s Academic Strategic Plan and the Campus Framework, both of which support the University’s aspiration to be the best place for veterans and their families. A LEED-certified facility, the NVRC will house the Institute for Veterans and Military Families (IVMF), which recently surpassed 100,000 people served, through programming and resources designed to enhance the lives of veterans, service members and military families. 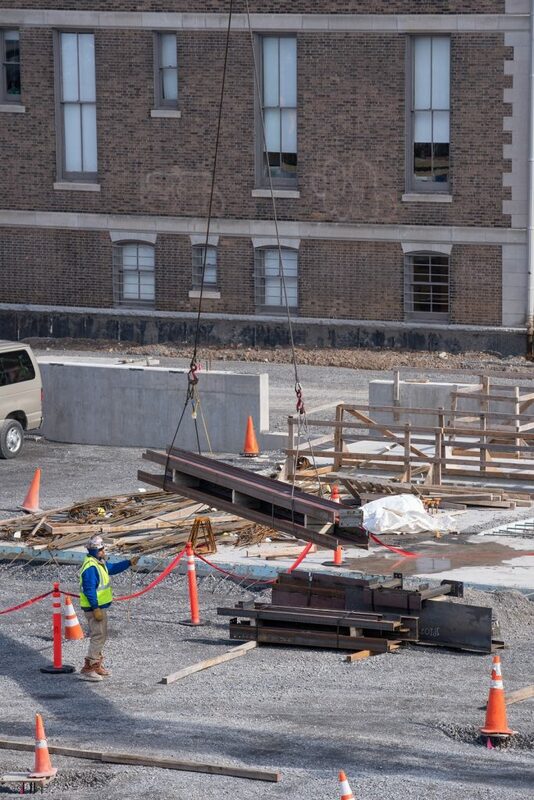 Michael Haynie, vice chancellor for strategic initiatives and innovation and executive director of IVMF, says the campus and broader Syracuse communities can expect to witness substantial construction activity in the weeks and months ahead now that the bulk of the site preparation work has been completed. Pete Sala, vice president and chief facilities officer, says this project is among the most innovative he has ever been a part of during his time at Syracuse University. To learn more about the NVRC and to stay up-to-date on project progress and milestones, visit NVRC.syr.edu. To view the live construction camera, streaming activity from the NVRC site 24 hours a day, visit nvrc.syr.edu/constructioncam/.